After a recent server upgrade, I had to install Subversion (SVN) to support some legacy code repositories I use (newer projects now use Github). As SVN isn’t directly supported by EasyApache 4, I had to go about setting up support for Apache myself. This tutorial explains how to achieve a similar setup. You can then download and setup the Subversion Apache module required to get SVN working on your server. Start by downloading the version of SVN you wish to use (in the below example, I’m using v1.7.14). You’ll need to configure SVN to look for the correct files on your server for it to work with EasyApache – this can be achieved by running the command on Line 14. Depends on the version of Apache on your system, the paths in the above command lines may be different. The paths used above are correct for CentOS systems at time of writing: 10th May 2018. If the installation goes well above, the make install command would have installed the required SVN modules to your system in the /usr/lib64/apache2/modules/ folder. Again, see the installation log in case the path is different. 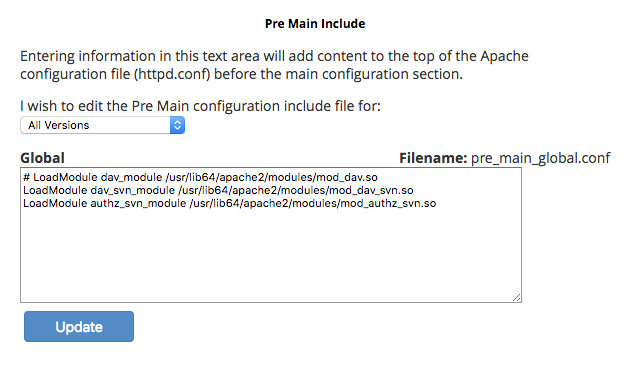 You can then update the Apache configuration on your system to enable these modules. This can be done with WHM on your system by navigating to [Service Configuration] > [Apache Configuration] > [Include Editor]. If there are no errors reported by WHM, the SVN module was successfully enabled and setup.